In this tutorial you will learn how to draw straight lines in Photoshop. I will also show you how to draw curved lines in Photoshop. And, to have a little fun I will teach you how to draw a colored line in Photoshop. [UPDATE 2019]: Though a few things have changed in Photoshop CC 2019, the same techniques apply for drawing a line in Photoshop. 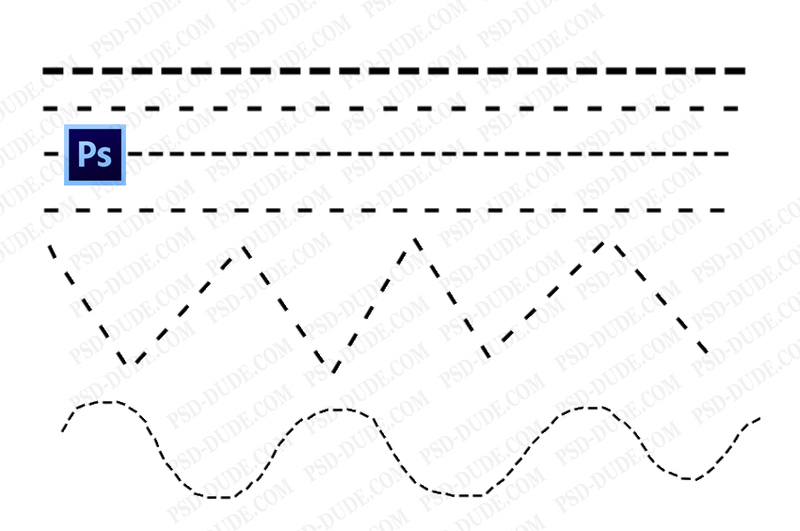 Check out the section about the new Curvature Pen Tool in Photoshop CC. To draw a line in Photoshop use the Brush Tool or the Pencil Tool. Pick a small size, hard round brush and simply draw a line. To draw a straight line in photoshop you have to keep the SHIFT key pressed and draw. To make horizontal or vertical lines hold down the SHIFT key and draw the line horizontally or vertically. For angled lines or diagonal lines, hold down the SHIFT key and click to add the end points for the lines. Photoshop will connect the dots with perfect lines. Another method will be to use the Line Tool available on the Photoshop Tools bar. This line is a vector shape so you can easily modify its shape, color, dimension without loosing quality. You can use the SHIFT key also for straight lines. Download my Line Shapes for Photoshop if you need vector lines for your projects. The third method is to draw a line using the Pen Tool. First, you have to check the Paths option. Then click to add the first point and click again to add the second point. For straight lines keep the SHIFT key pressed. So, pick the Brush Tool and select a Hard Round brush, size 3px, black. With the Pen Tool, select Paths and draw a line. The line is added as a Work Path. You can now delete the Path or use it to draw other lines. You can move the path, resize it, change its shape, rotate it, etc. TIP: You have to have a layer selected before you Stroke Path otherwise it might not work. Here is a quick tutorial on how to draw a path and how to Stroke Path In Photoshop With The Brush Tool (video tutorial). 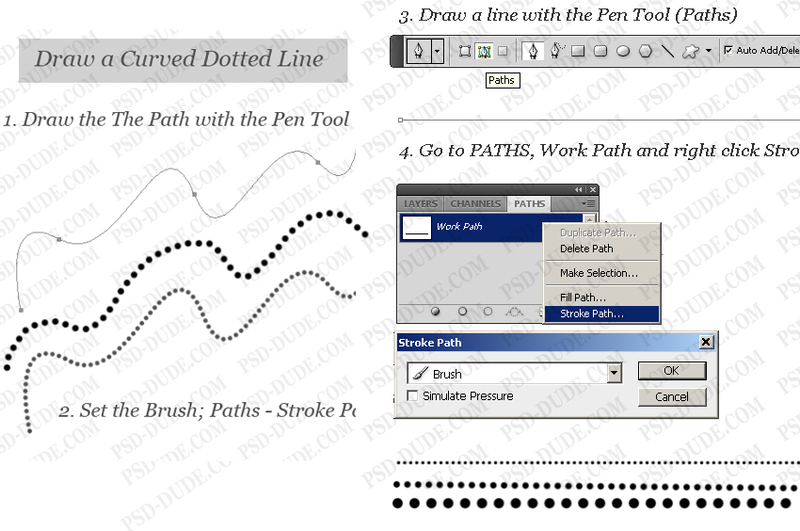 Also you can read the Stroke Path Photoshop tutorial for beginners. To draw curved lines in Photoshop you have to use the Pen Tool with Paths selected, to make a curved path. Using the Pen tool, drag to create the first smooth point of the curved segment, and release the mouse button. To draw a curved line just right click on the Work Path and choose Stroke Path. From the list pick the Brush Tool. Photoshop CC 2019 comes with a bunch of useful and new stuff. One of them is the new Curvature Pen Tool. You will find this under the Pen Tool icon if you long press it. To use the new Curvature Pen Tool you have to click once and Photoshop will draw curved lines that connect the points you click. Double clicking will create sharp corners. If you click on the line between 2 points you can add and drag an extra point to create a curved line. After you created the curved line you have to Stroke Path to draw the line. To draw a colored line in Photoshop, add a layer style to the layer where you've drawn the line. 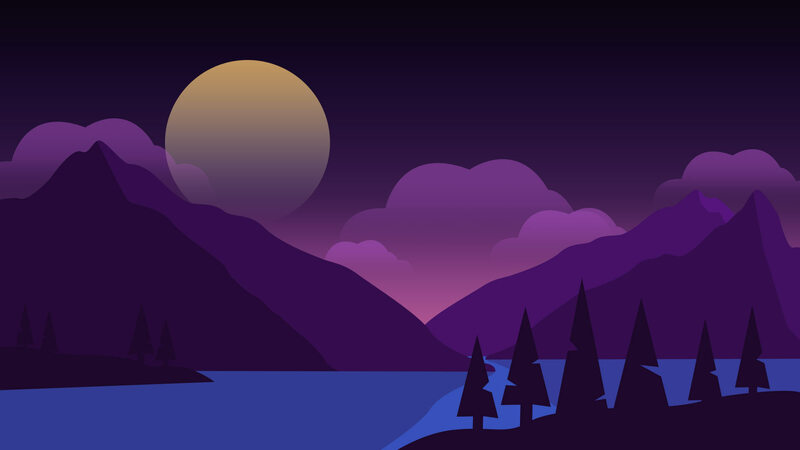 Use a Gradient Overlay layer style to make colored lines in Photoshop. To draw a dotted line in Photoshop you have to use a dotted line brush. In this tutorial you will learn how to create Dotted Line in Photoshop. To draw a dashed line in Photoshop you have to use a dashed line brush. In this tutorial you will learn how to create Dashed Line in Photoshop. Press Control-T to extend a line in Photoshop. This resize method only works for straight lines (vertical lines and horizontal lines). How to modify line width in photoshop? If you use the Line Tool you have to set the line thickness. If you use the Brush Tool, to make a thicker line in Photoshop you have to set the size of the Brush Tool to a larger size. To draw parallel lines in Photoshop you draw a straight line (vertical or horizontal) and press Control-J to duplicate. Then you move the line and you get parallel lines. Quick tip: create a new layer with a horizontal/vertical gradient (#000000, opacity 100% and #000000, opacity 0%). Go to Filter > Distort > Wave and make these settings to draw parallel lines in Photoshop. 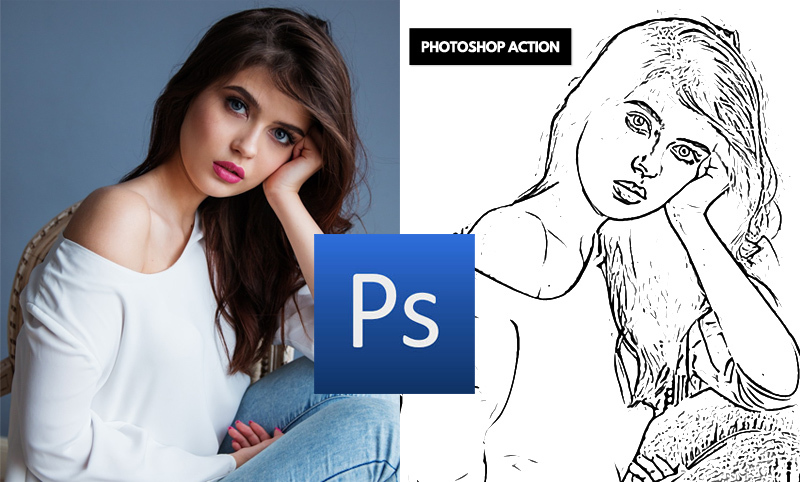 If you want to convert a photo to line drawing you can use this Line Art Photoshop action. Use these Line Art Photoshop Brushes to create beautiful line art in Photoshop. Here's a quick video tip about how to draw shapes with straight lines, sharp corners and rounded corners using the Pen Tool. 9 comment(s) for "Draw a Line in Photoshop"
Can any of your lessons, actions, and patterns be used in PSE 10? I have never used PS or PSE at all but I can't afford the BIG one (PS CS) so I'm going to purchase PSE 10 and really would like to know if any of your awesome TUTs would work for that program. But you have to research more about this problem before you purchase, there are lots of topics on this subject, search on Google!